Grass Tree. 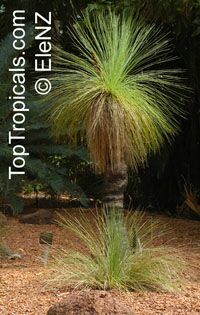 Commonly called Grass Trees, Xanthorrhoea plants are also known as Balga Grass to the Australian aborigines, which is their word for black boy. The Aborigines probably called these plants balga because after a wild fire, the bottom leaves burn away revealing a singed black trunk with long green reed-like leaves extending from the top of the trunk giving the appearance of black figures. 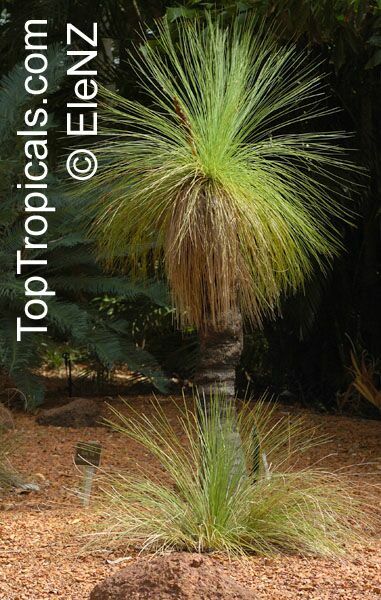 All species of Xanthorrhoea are very slow growing, but they are also very long lived - up to 600 years! Long straight spears of white blossoms extend from the top of the tree especially in the year following wild fires. 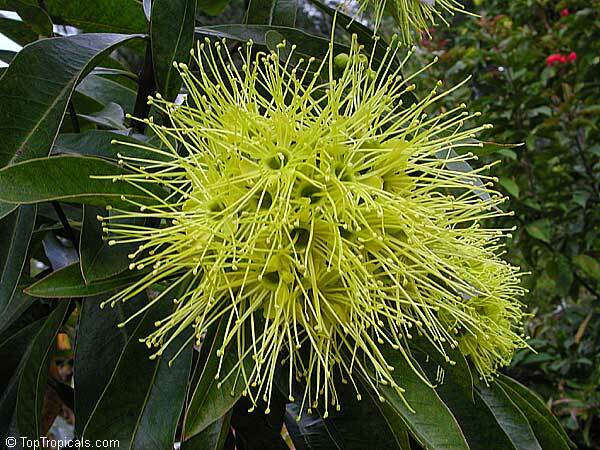 The flowering spikes of the grass tree were soaked in water to make a sweet drink, fresh or slightly fermented. The soft bases of the young leaves were eaten. Europeans harvested the gum to make varnishes and lacquers. 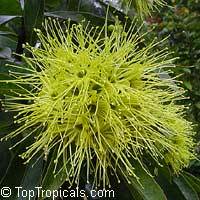 Can be grown very successfully in pots. Place seeds on top of soil surface, using draining potting mix plus sand, keep warm, only slightly moist and in bright light. Seeds can not be kept wet. Black Malanga, Blue Taro. 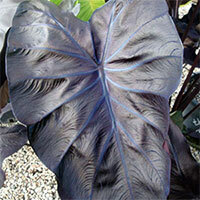 Huge leaves of dusty purple dangle from maroon-stemmed plants! The most spectacular Elephant's Ear. At 5-6 feet high and wide it's perfect in pots, spreading its graceful foliage over the border; or standing in solitary splendor in partly-shaded gardens. Survives hard freeze, goes dormant in cold winter. African shrub or small multi-stemmed tree growing in the sandveld and widely distributed throughout the eastern parts of Southern Africa. 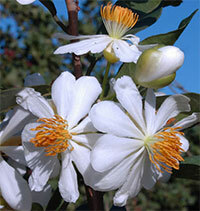 Flowers are white with a dense central cluster of yellow anthers and resembling a small white rose. The pulp around the seeds is relished by birds.